It’s the era where people are more attracted to the visual content. Many people want to add GIFs in WordPress. In the past few years, the usage of these animated GIFs has increased so much. Many bloggers are trying to spread their words through GIFs. You may have noticed that the social media platforms like Twitter are providing an option to embed GIFs. Have you ever thought to add GIFs in WordPress posts and pages? This can give you more exposure as people like to see funny animated content. It’s seen that posts with animated reactions are shared more because people like to see those funny, moody reactions. Many reputed websites are using GIFs to add more value to their content and it’s working. But if you create your own GIFs then it will take so much time and size wouldn’t be good. One of the biggest demerits is that GIFs can slow down your website speed. Most of the users have shared web hosting and GIFs will consume more bandwidth than images. But not so much as you think. If you have a decent server, there wouldn’t be any problem. That’s why it’s recommended to use Giphy because it’s one of the biggest sources of GIFs. You will be using Giphypress which is a WordPress plugin. WordPress repository is full of thousands of plugins and for adding GIFs, you have to install and activate Giphypress. After installation, you don’t need to configure its settings. You have to use it directly from your WordPress post editor. Open any post and you will see a button along with your post editing options. When you hover over it, you will see “GIPHY GIF Search”. Click on that button and a popup will appear showing you many GIFs. There will be a search option to find your favorite GIF. 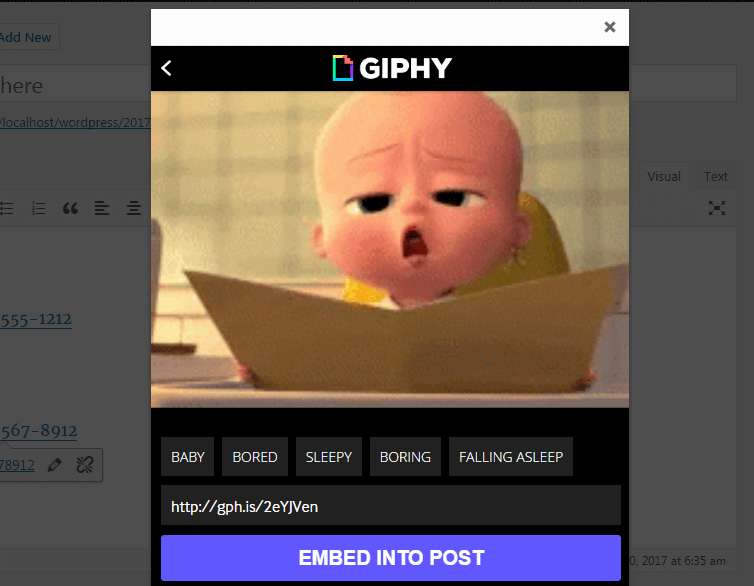 After searching, click on the GIF you want to add and you will see an “Embed into post” button. Use it and your GIF will get embedded in your blog post. You can also choose many other options after searching. As I have chosen a baby, there are different options to set the mood. It can be bored, sleepy, falling asleep etc. Now you can check the preview of your blog post which will consist the GIF you have chosen before. Depending on the width of the GIF, it will appear in your post. It’s an iframe whose width can be changed if you are a techie person. Otherwise, you can use it the way it is. Save your post and publish it. You have successfully added those shiny and animated reactions to your post which can help you improve the user experience. I strongly believe that with WordPress, there is nothing difficult. You can easily solve the basic problems and can accomplish the tasks you desire. There are many plugins to use and Giphypress can help you. You can easily add GIFs in WordPress within no time. If you face any problem, feel free to ask.